Medieval manuscripts sometimes are made up of different texts which may have been made at different times for different purposes in different places and were later bound together. 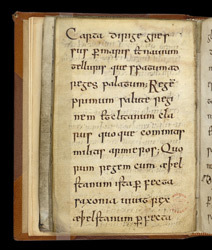 This manuscript is made up of prayers, hymns and other material for the daily prayers of monks or nuns written by a number of scribes with varying degrees of skill in early 11th-century Anglo-Saxon England. It could represent an informal collection of prayers, and a scholar who has studied the manuscript has suggested that it might have been a collection of notes for or by beginners which were written into a kind of notebook of blank pages. It includes a calendar for a prayerbook (to help the user organise his or her daily prayers much as a modern diary is used to organise time) and also a poem about King Aethelstan and a prayer for King Aethelred's soul. The poem about Aethelstan is written in grand large letters, but this is in contrast to its unskilled Latin. It has been suggested that it is a poor translation of a poem originally in Old English. It begins by commanding a letter to go across the sea to praise and wish well the king and his court. It also mentions Constantine, a Scottish king, who 'hastens to Britain' in support of Aethelstan.